In difficult times, it is easy to feel overwhelmed, resourceless and alone. There is nothing great about this! If this is where you are right now, remember that you have all the tools you need to feel great again. The trick is just to think of these again! Here is a quick list of things that you can do to feel good again. Pamper yourself. Mix your favorite ingredients and make a face mask, take a bath, burn some incense while you read, prepare yourself a colorful salad, or wear your favorite socks. Take a few minutes to take care of yourself. Be selfish for a few moments and you’ll soon feel better! Do something you enjoy. When we’re feeling low, it’s easy to feel sluggish and unmotivated to do anything. In those moments, I try to push myself to do things I normally enjoy like painting, reading or baking. These simple joys usually make me feel content and take my mind off of what is bothering me. Sit. There’s nothing more powerful when you are feeling low to recenter yourself on the present moment. Sit down straight and take deep breaths. Observe these breaths and relax your body. After only a few breaths you should feel refreshed and more ready to face your feelings. Connect. With billions of people in the world, it is quite impossible that you are truly alone at any given moment. I often find that when I feel overwhelmed, writing or talking to friends and family cheers me up. Other times, it’s good to be in the company of strangers at a workshop or to go people watching at a coffee shop. Whatever you do, remind yourself that you are not alone! I hope these tips help you out. If you are feeling low, I’m sending you happy thoughts! Try out these few tricks and you’ll soon feel like yourself again. The truth is, everyone feels low sometimes, and there’s nothing wrong with that. Take your time, take care of yourself, and things will go just fine. 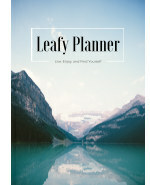 If you want more tricks and support on building wellbeing habits, I’ve launched a Kickstarter campaign for a planner I’ve written, the Leafy Planner. Take a look! Walking helps me too, failing that loud music accompanied by raucous singing! These are wonderful tips for disconnecting with the stresses of the day, and to take a breath! I have recently discovered the joy of deep breathing although it is still an exercise in discipline to sit still for a spell. My go-to de-stressor is to go for a Wog (walking/jogging). Deep breathing sounds great! I used to be very restless when I first started meditation and often still am, so it really is a practice!! !